When my friends talk about Thanksgiving traditions, they talk about classic things: turkey, specialty sides, visiting infrequently seen loved ones, maybe even some family squabbles. For the last few years, my family traveled during Thanksgiving. And not to see relatives, but for a family vacation. The reasoning? With everyone’s busy schedule, especially with my brother and I’s different class and/or work schedules, Thanksgiving is one of the only times of the year where we are both definitely going to have days free. Early on I hated it. Especially during my first two years of college, I missed the opportunity to go home and reconnect with my high school friends. Being in a group chat where all my friends were talking about the movies they were going to see and the places they were going to visit made me sad. And while we never had a big Thanksgiving celebration, I wanted to have some sense of ‘normalcy’ that had roots in wanting to fit in with others. I didn’t want to be the weird girl who didn’t have a traditional Thanksgiving, who some years went without even a turkey sandwich. Years later, however, I have come to love it. Don’t get me wrong, I still miss the corny aspects like making a bunch of sides and seeing my hometown friends. But now that I have my own apartment with my own kitchen I can just host a Friendsgiving in the days leading up to the holiday, giving me my cooking fix, and FaceTime friends from home. And as a benefit, I also get to travel. This past Thanksgiving was one of my favorites. My family wanted to go somewhere more local, as my brother who goes to school in Pittsburgh needed to be back for marching band the Friday after Thanksgiving. So we went to Washington, D.C., essentially a mecca for a history nerd like me. D.C. was fantastic. While people wax poetry about the spring and its cherry blossoms, I was here for the fall’s reddening leaves and crisp air. It was admittedly chilly some days, but clear skies and never-ending museums made it worth it. For those planning on visiting D.C. who want some inspiration, read about my favorite places below. Can I just start by saying how amazing the National Mall is? Most cities I’ve been to make you work to find everything you are looking for. You have to parade across town to see the city’s highlights, which logically makes sense because most cities don’t section off blocks of the city and dedicate them to museums and national monuments. But D.C. makes it easy for you. The National Mall is a concentration of D.C.’s must-see museums and monuments. And my favorite part is that it is great to visit no matter the time. The first night my family arrived in D.C., we stopped by the Mall to jumpstart our sightseeing. 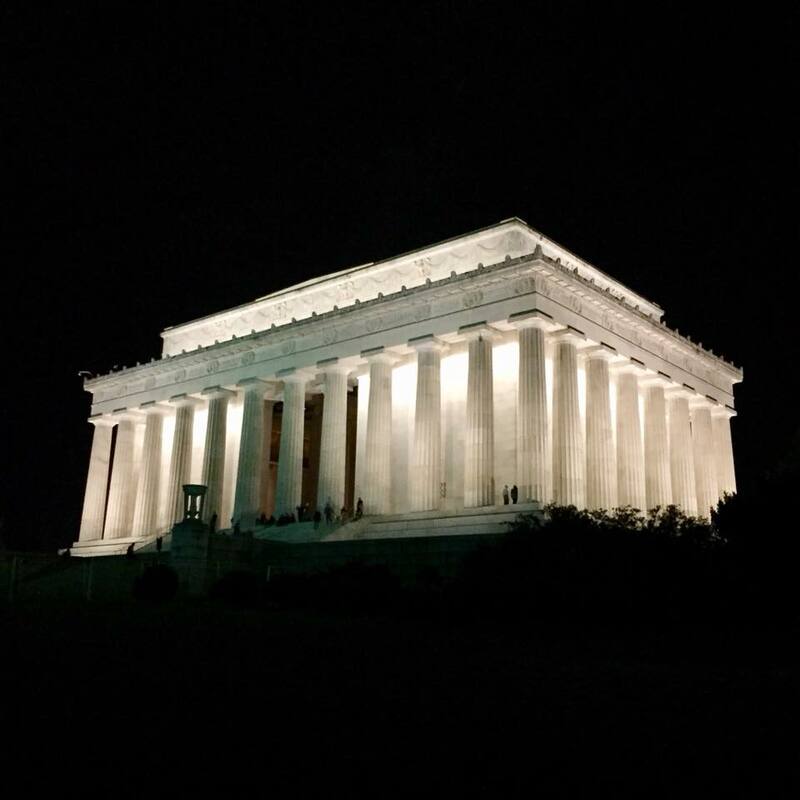 Exploring the Lincoln Memorial, we were treated to an experience not as many travelers have. The memorial was near deserted it looked much more impressive standing illuminated against the night’s sky. And the reflection of the Washington Monument seemed more ethereal than it did in the daylight, although the sheer length of the Reflecting Pool wasn’t captured quite as much as it was during the day. While I enjoyed the silence nighttime viewing allowed, that’s not to say it wasn’t also fantastic during the day. My family routinely went up and down the Mall museum hopping, and rather than feeling the pressure to take an Uber for fear of getting lost, the Mall provided the security of knowing that no matter where you were, from the Lincoln Memorial to the Capitol Building, you were surrounded by interesting things to do. The movie Night at the Museum has made the Museum of Natural History what I imagine most people think of when they think of Smithsonian museums. How could it not? It featured Ben Stiller, Robin Williams, and Owen Wilson, and confirmed the belief I’m sure everyone who has ever seen Toy Story still secretly has that when you aren’t around inanimate objects come to life. But there is more to the Smithsonian museums than natural history! One of my favorite topics is American history, something I’ve talked about on this blog. While it was my 10th grade AP European History class that got me interested in history as a whole, it was my 11th grade AP United States History class that got me hooked on the subject of American history. So naturally, I couldn’t pass up a visit to the Smithsonian National Museum of American History. The museum does not disappoint. There were topics for everyone, regardless of what subject you were interested in. Want to take a deep dive into American military history? ‘The Price of Freedom: Americans at War’ exhibit is for you. More interested in the executive branch? How about checking out ‘The American Presidency: A Glorious Burden.’ Someone interested in seeing how she could combine her loves for marketing and history? Good thing there is an ‘Advertising War: Selling Americans on World War I’ call out. While I understand not everyone loves history the way I do, I can’t imagine a better place to try to sell someone on how fascinating the subject is than at this museum. I am a book lover. In high school I volunteered after school at my local library, I’m currently in two book clubs, and am absolutely addicted to beating my Goodreads Book Challenge. Everywhere in the world I’ve traveled I’ve tried to find a library to visit, because no matter how ornately decorative a library is, there is an element of comfort. A place where knowledge is so revered and respected makes me feel like I’m surrounded by friends, in a place inherently safe. A place that has a feeling of being home. And considering I can miss home during Thanksgiving, the Library of Congress felt like a natural stop, one I was very grateful we took. 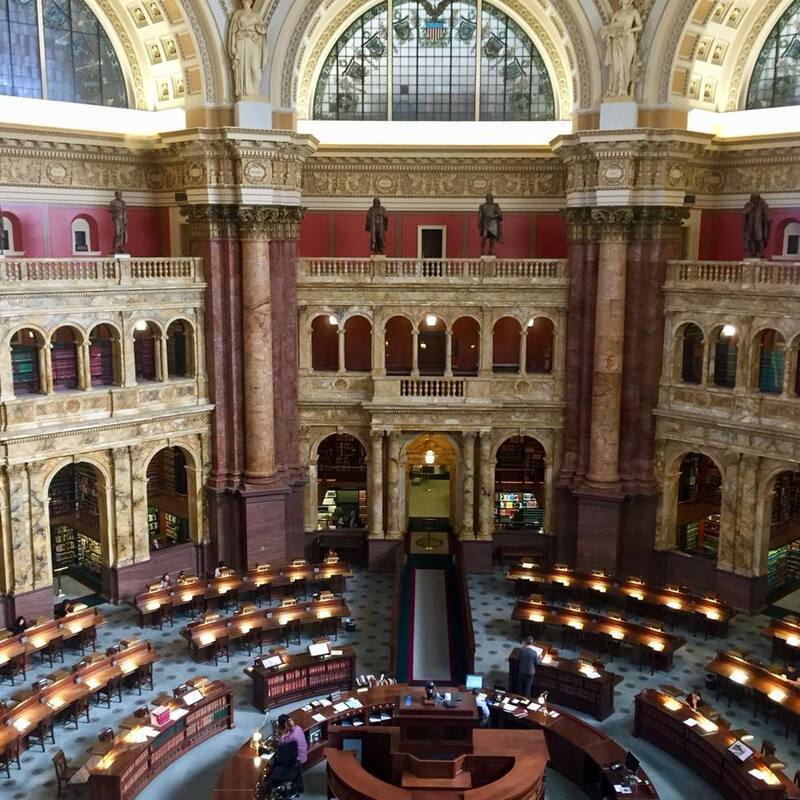 While our visit to the Library of Congress didn’t include strolling up and down thousands of bookshelves like I had been expecting, I wasn’t disappointed. We were able to check out exhibits on books throughout the ages, including a remodel of Thomas Jefferson’s personal library, as well as a collection of maps throughout the years that highlighted how people’s perceptions of the world have evolved, and continues to evolve. And then there is the main reading room. While I was not able to explore during my visit, I was able to see an aerial view of the room, which is everything I had wanted in the national library. It’s a beautiful circle of wood desks in a large space with gold arches building on top of one another. And while I wasn’t able to see for myself, each arch was toying with my curiosity as the beginnings of bookshelves were able to be seen, stretching on for who knows how long. It was stunning, as was the rest of the building, featuring high ceilings, intricate paintings, and marble staircases. It was a place that showcased how spectacular books and knowledge as a whole are, making it the perfect place for me to visit. Most of the museums I went to in D.C. were filled with hours worth of exhibits to explore. I could have spent an entire day in some of them, regardless of their topic. But not the National Archives Museum. While the National Archives Museum is just as imposing of a building as the rest of the museums on the National Mall, what separates it from the others is the focus of the exhibits. Don’t get me wrong, other museums have focused topics of interest. One is American history, another on space. Some focus on more specific themes, such as espionage. But what sets the National Archives Museums apart is that instead of focusing on a theme, it focuses on the specific key pieces it holds. Namely the Constitution, the Declaration of Independence, and the Bill of Rights. There are other documents in the museum, don’t get me wrong. But these are the crown jewels, what makes people line up to visit. As they should! Getting the chance to see these documents was fascinating. I had spent so many years of my life growing up and learning about them, reading parts of them, even seeing copies in textbooks, that it was unbelievable to see the real thing. Especially since it was so unlike what I was expected. Most prominently was how faded the documents were. When they were reprinted in history books growing up, the text was bold and commanding, each word prominently displayed. But in reality, there were entire sections fading to the point they were almost impossible to discern. But it was worth it. Although you couldn’t take pictures and it was crowded, it was fun. Standing with my dad, trying to make out names of our forefathers on the back of the Declaration of Independence was like a real-life search and find, and recognizing passages in the Constitution reignited my love for history and the importance of intentionality with words. It was exciting, and something that reminded me why I love American history and history as a whole. 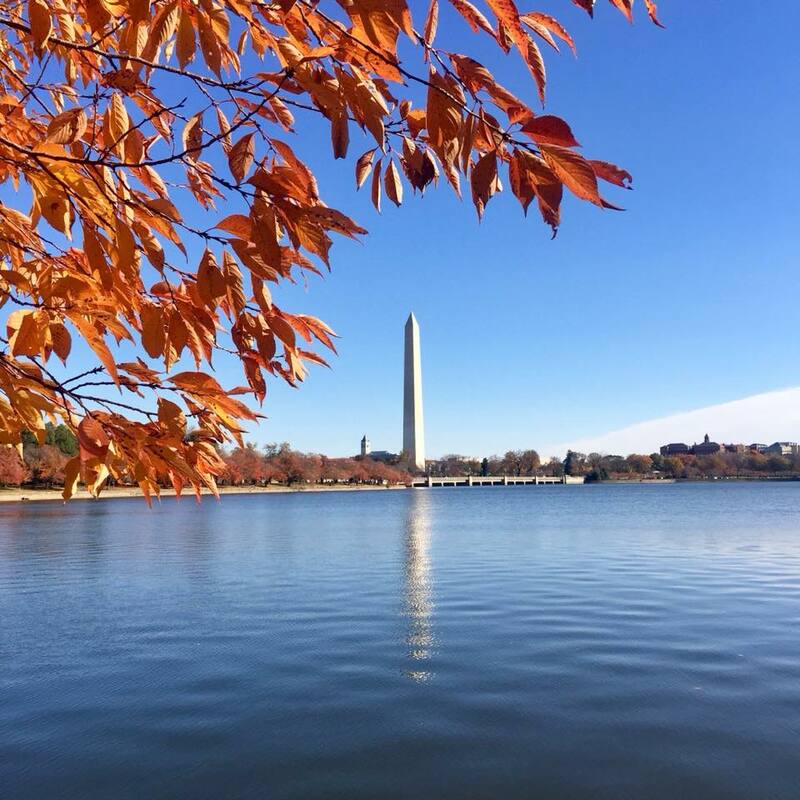 Although late November is notoriously chilly, we had overall good weather during our trip to D.C. Admittedly it got too cold to be comfortable once the sun set, but during the day, while being active, it was a normally a series of beautiful fall days. And as someone living in New England, what is better than weather that requires a scarf and fall jacket? The Tidal Basin walk is an aptly named path that surrounds the Tidal Basin, a reservoir right next to the National Mall. The walk highlights memorials for famous men in history, including Martin Luther King Jr., Franklin Delano Roosevelt, and Thomas Jefferson. And while the memorials are great to see, the walk itself is stunning. When looking up pictures of the Tidal Basin, usually seen are the famed cherry blossoms. But just because it wasn’t spring when I visited doesn’t mean the beauty was in any way lessened. Instead of seeing pink flowers, we were able to walk through reddening leaves just beginning to fall off of the trees. The Tidal Basin was fun because there is no hours or times associated with it. There was no rush, no pressure to see everything. While still in the heart of the city, it provided an escape. We weren’t entrenched in nature, but it still felt sectioned off from the main hustle of the city. We set our own pace, stayed as long as we wished at each of the memorials, and enjoyed people watching. The beauty of the Tidal Basin is the freedom in it. Walking for the sake of walking, for the sake of appreciating its beauty, is so rarely something I slow down to do, and something I’m grateful Washington D.C. offered. For risk of sounding morbid, or like I want to live in a horror movie, I love cemeteries. I think the way people honor those that have passed is interesting, and more often than not cemeteries are beautiful places. The Arlington National Cemetery, located just outside of D.C., proves this to be true. The Arlington National Cemetery is beautiful in a completely different way than other cemeteries I’ve been to. When I was in Rome, I visited the Protestant Cemetery and what made it spectacular was the lack of order, as everything was unique and each gravesite was elaborately designed by sculptures and writers. 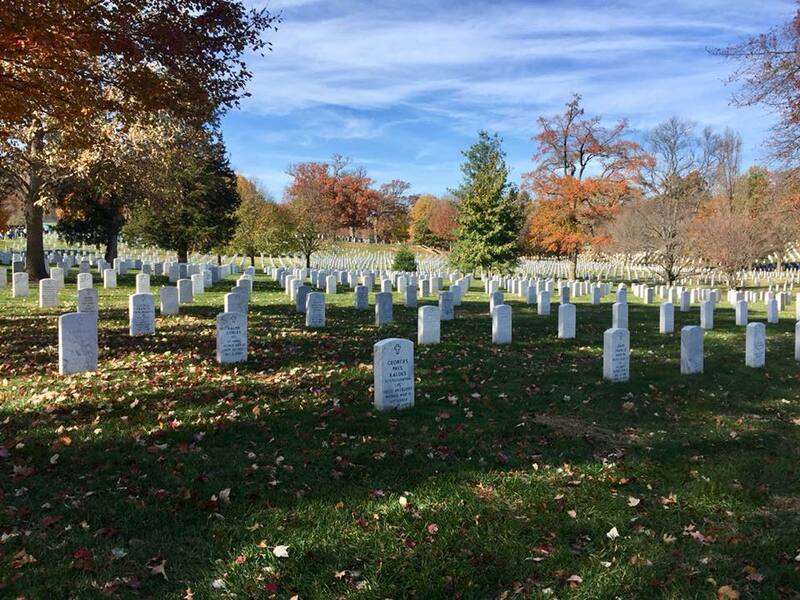 Arlington, by contrast, is meticulously ordered, with each headstone being the exact same distance from the ones next to it, creating perfectly straight lines stretching as far as the eye can see. And while less sentimentally designed than the one in Rome, it creates an equally striking atmosphere. One of the more spectacular parts of Arlington National Cemetery, however, is the Tomb of the Unknown Soldier. This tomb is fascinating because it has been consistently guarded since 1937 by the U.S. Army. There is a strict way of guarding the tomb and a changing of the guard occurs every half hour or hour, depending on the season (and every two hours during the evening). The entire process is intriguing and shows the military’s respect for those who have died in the line of duty without their remains being identified. What I loved the most is that against the background of the cemetery, the tomb and the reverence attributed to it was that much more impactful. I was standing among hundreds of thousands of people who had sacrificed his or her life for their country, something I don’t usually think about and appreciate on a regular basis. Washington D.C. is a history nerd’s dream. When the most prominent attractions to check off are almost exclusively related to history and museums, and everyone you meet is excited about learning and knowledge as a whole, what else do you need? This entry was posted in History, North America, Travel and tagged history, museums, top-attractions, travel, washington-dc. Bookmark the permalink.